Trip and fall accidents happen all too often and typically end with serious injuries. When these kinds of accidents are caused by the negligence, carelessness or recklessness of others, victims often seek legal recourse for compensation. 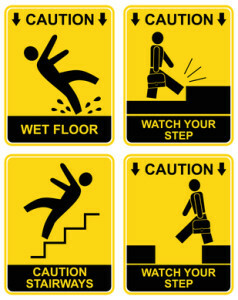 Common areas were trip and fall accidents occur include ramp ways, doorways, uneven surfaces, heavy traffic areas, stairways, unstable working surfaces, unguarded heights and outdoors on slippery or wet surfaces caused by ice, snow or rain. Hundreds of thousands of individuals in the U.S. suffer a serious injury from a trip and fall accident each year. In fact, nearly 40 victims – mostly the elderly – die each day of a slip and fall accident. Even though these are common occurrences, only a few trip and fall claims and lawsuits are ever filed and resolved. Out of that, only a handful of victim cases that are finally heard by a judge and jury are ever resolved successfully. This is because trip and fall cases are often more challenging than many individuals think. Winning a premises liability lawsuit for compensation or negotiating a settlement for recompense requires the victim to prove how the actions or inactions of others directly caused their injuries. However, traumatized victims seriously injured in a trip and fall case often have difficulties proving how they had no reasonable means available to avoid causing their injuries, even if they were paying attention to their own actions. In addition, the victim must also prove that the property owner or others in charge had reasonable knowledge that the potential trip and fall danger existed. Proof must also show that the those at fault for the injuries had adequate and reasonable time to repair the problem, but took no action to correct it. Warn others of wet surfaces by barricading the area or marking it with signage. Correct any dangerous or hazardous condition on a stairway or walkway. Properly maintain equipment and machinery that resulted in personal injury. Provide sufficient security to ensure a safe environment in a hazardous area. Maintain a safe environment in a retail establishment that resulted in an injury. If the trip and fall accident occurred on government property or at a public park, federal and state government agencies might be held financially liable for any injuries or fatalities. However, filing a claim or lawsuit against the government can be challenging and often requires the skills of an experienced personal injury premises liability attorney. Hire investigators and experts to testify to the extent of the problem and your medical condition. File all documents in a timely manner. Most importantly, your attorney will prove your case by showing how you did not and could not have caused the accident on your own. Your lawyer will prove how you were not distracted at the time of the accident and had a legitimate reason to be in the dangerous or hazardous area. The attorney working on your behalf will show that there were not obvious warning signs in the area or barricades in place to minimize the potential of causing serious harm to you or anyone else. After building a case for compensation, your attorney will use their years of negotiating skills to seek an out of court settlement with the claims adjuster or opposing counsel. If you do not accept the settlement amount, your attorney will build a strong case to take your lawsuit to trial.